As a results-oriented law firm, Blaney, Tweedy & Tipton, PLLC, is devoted to helping clients in the Oklahoma City area tackle business law matters. Our attorneys have more than 75 years of combined experience handling cases that involve issues such as banking, business organization, contract reviews, and litigation. When clients work with us, they can trust that they have enlisted a skilled team of professionals who will fight for their best interests. Whether the goal is to launch a business, expand a business or simply protect the business, we can help. We know how important it is that every matter is handled quickly and thoroughly. Our law firm’s staff is adept at developing solutions that are cost-efficient as well as forward-thinking, resolving today’s issues and minimizing the risk of encountering a problem down the road. Blaney, Tweedy & Tipton, PLLC, works primarily with small to midsized businesses. However, there is no case too big for our law firm to handle. In addition to our comprehensive representation, we also provide exceptional customer service. We ensure that the people we work with know their options and get answers to their questions. For our clients’ convenience, we accept credit cards as a form of payment. Blaney, Tweedy & Tipton, PLLC handles regulatory, compliance and risk management issues for our lender, creditor, consumer, and commercial clients. Our attorneys have extensive experience. 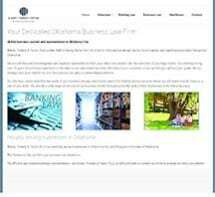 If you are planning to start your own business in Oklahoma or if you want to expand your current business contact The law offices of Blaney, Tweedy & Tipton, PLLC. With over 60 years of combined experience, the lawyers at Blaney, Tweedy & Tipton, PLLC doggedly pursue just legal resolutions for patients and medical professionals.